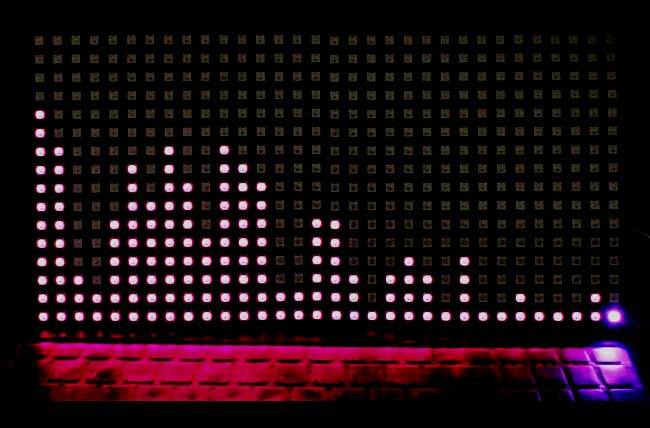 LED Music Spectrum generates the beautiful lighting pattern according to the intensity of music. It contains many RGB LEDs which not only turns on and off as per the music but also change color according to the music. There are lots of DIY LED Music Spectrum kits available in the market, but here we are going to build this Music Spectrum using NeoPixel RGB LED Matrix and ARM microcontroller. A control panel is fabricated on PCB for this project, check out the whole process below and see this Colorful Music Spectrum in working in the Video given at the end. Connect two 16*16 RGB LED matrixes by connecting DOU interface of the first LED matrix to the DIN interface of the second one, that’s make a bigger 16*32 RGB LED Matrix. The operating voltage of my LED Matrix is 5V, so I would like to connect two LED power interfaces into an outlet of a 5V control power. Please take a note that the maximum current of a working LED is 18A, so it is recommended to use an over 40 A control power and choose a thick enough wire to connect it. Each LED is controlled by 24-bit data with its structure of G7~G0+R7~R0+B7~B0. The data is sent by the principle of higher place first and in accordance with the sequence of GRB. In the diagram, IN_CH is an audio access terminal of a computer and PC3 is the amplified output signal which has been further sent to STM 32. C13, R6 and R7 are grouped into a signal-strengthening circuit, which can raise the signal voltage and turn a negative voltage into a positive one. The circuit following R8 is signal-amplifying one, with its signal strength of PC 3 equal to R9/R8 times of the previous signal before R8. IN 1+ is the end to set the minimum voltage value output from OUT 1. Here we recommend using EasyEDA to design a control panel. EasyEDA is simple and efficient online EDA designing software, by which you can draw a diagram or cut a pattern conveniently. In EasyEDA, the database for the components is huge! You can easily select some of the basic components on the left of the page or search hundreds and thousands of components in their library so it is very easy for you to find what you needed. Following is the link of my complete circuit diagram and PCB layout, where you can see it very clearly. After finishing the PCB design, click on the icon of Fabrication output above, it will take you to the “PCB order” page. Here you can select the number of PCBs, no of copper layers, PCB thickness, copper weight, and even the PCB color. After you have selected all of the options, click “Save to Cart” and complete your order, to receive your PCBs within few days. Here are the PCB boards after manufacturing; the quality of PCBs is quite impressive. The traces are routed precisely and all of the printing is very clear. Then components are soldered on the PCB as shown in the below image, this completes our Control Panel for Music Spectrum. Connect the computer audio cable (3.5mm jack) into the beta version of the welded interface, and then open the computer music (It is possible that you may not hear any sound of the computer music after inserting the audio line. Under such circumstance, we can use a 1-turn-two connector to transform the computer audio output into two channels output. One channel is connected to the core-PCB-board while the other to a speaker. This is a connecting diagram of the system, where the core-board is powered by a computer USB and connected by an audio output interface. The other interface of the computer audio output is connected to an external speaker. It is feasible that the signal line of the lattice-control interface is connected with the ground wire and the dot- matrix DIN and GND. Now you just need to upload the below given Program Code into STM32F103RBT6 ARM Microcontroller and you can see the colorful music spectrum. So here we have built the LED Music Spectrum with RGB LEDs, hope you like it and you can also change the program to make the music spectrum more splendid.